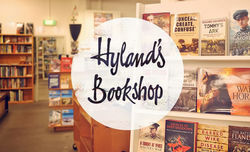 Established in 1965, Hyland'sis a specialist bookshop with an unsurpassed range of books on military history, aviation, naval and maritime history. You’ll also find books on railway and transport history, mountaineering, hunting, shooting and associated videos. In fact, with over 22,000 books on shelf, there’s bound to be a book to suit every history and transport reader. We are now located a large first floor , retired movie theatre in MidCity Arcade, 200 Bourke street. We welcome keen visitors and history buffs alike.